Wrestling fans have been waiting for this day for over a year now. Almost 13 months ago, one of the biggest names in professional wrestling history, and arguably the biggest pop icon it has ever produced, left the business to pursue a full-fledged career in movie-making. With only a brief appearance in the mega-hit The Mummy Returns, producers saw in him a very lucrative marketing tool, as his face and image were repeatedly used to sell the record-breaking film. The amount of time he was seen in the trailer was almost as much as the amount of time that he was seen in the film, yet his name was still used to sell the movie and sell it very well. With the positive response he received, he paved the way for what looks to be a blossoming Hollywood career. It's very difficult to quantify The Rock's popularity at this point. The WWF's two main shows draw an average of anywhere between four and six million viewers weekly. At the height of its popularity, a few months before The Rock left his regular TV gig, the WWF was drawing upward of eight million viewers a week for its main live Monday night broadcast, Raw. What the WWF will point out is that most of these viewers fall into the 18-30 male demographic, so we can see why Hollywood was paying attention. So after a hugely successful appearance on Saturday Night Live and numerous personal appearances, it was deemed that The Rock, AKA Dwayne Johnson, had what it takes to become a big Hollywood star. Now it seems as though that confidence was sound and is about to pay off big-time for Universal. 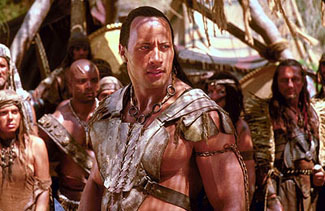 Budgeted at a relatively modest $60 million, The Scorpion King is set to debut on an extremely impressive screen count of 3,443. The screen count alone points to a big opening, as it usually reflects exhibitors' confidence in the drawing power of the film. With a Superbowl ad and relentless marketing backing it up, The Scorpion King seems likely to open just north of the coveted $40 million mark. Also debuting this weekend is the Sandra Bullock starrer Murder by Numbers. This dark thriller might have been too dark for its own good, as it is receiving very little market visibility. Debuting at a modest 2,663 venues, this film about two teenagers who try to commit the perfect run of serial murders is a departure for Bullock, who usually makes her money on light romantic comedies. Playing against type is nothing new for Bullock, but this quick change seems likely to snap her string of recent success. With her last film, Miss Congeniality, being a big hit, Bullock takes on the role of a very different cop, and it seems that her fans aren't ready to embrace that as of yet. The film has not received enough marketing for me to expect it to pull in more than a weekend number in the low double-digits. And that is unfortunate, because I thought the movie could be sold. Now, it seems that an attempt was never made.